The online version of this article ( https://doi.org/10.1186/s12992-018-0410-5) contains supplementary material, which is available to authorized users. Rehabilitation is an integral component of the therapeutic continuum that every health system must strengthen on the path to universal health coverage (UHC) . Today there is a nearly universal consensus that access to health related rehabilitation (HRR) is indispensable for the realization of the right to health and a fundamental precondition for the societal inclusion of persons living with disability. This consensus is reflected in the United Nations Convention on the Rights of Persons with Disabilities (CRPD) – the most comprehensive binding legal instrument on the protection of the rights of persons with disabilities - which has been ratified by 87% of the world’s nations and requires signatories to organize, strengthen and extend HRR programmes to ensure equitable and timely access to quality services . In the 10 years that have transpired since the proclamation of the CRPD, recognition of the importance of rehabilitation has grown considerably [4, 5, 6, 7, 8, 9, 10, 11, 12, 13]. Acknowledgment is also increasing that alignment of rehabilitation policies, systems and services with the standards of the CRPD is necessary if we are to ensure a stronger, effective and more holistic response to the diverse rehabilitation needs of the ever expanding population living with disability [14, 15, 16, 17, 18, 19, 20]. To ensure countries meet their international legal obligations and achieve meaningful progress towards UHC, the World Health Organization (WHO) has identified equity oriented monitoring and the development of indicators for persons with disabilities as a global priority , including indicators for rehabilitation . Specifically, much of the existing research has focused on the development of clinical governance measures for various disease groups for the purpose of assessing improvements in quality of HRR [25, 26, 27, 28, 29, 30, 31, 32, 33]. Along with quality of care indicators, community based rehabilitation (CBR) indicators have generated interest . These indicators take the form of surveys to capture user’s experiences of a range of broad measures across several domains of social policy . Important though these indicators are, it is not clear that in the aggregate they constitute an adequate account of the human rights obligations of States in relation to HRR  as they tend to overemphasize individual outcomes rather than health policy structures and organizational processes. Moreover, their strict focus on community oriented inclusive development measures makes them, to a significant degree, inappropriate for monitoring the HRR sector, not only in affluent nations, where the application of WHO’s community based rehabilitation framework is very limited or problematic , but also in less developed countries . In fact, researchers have started experimenting with frameworks developed in other health areas in an effort to assess the capacity of health system to deliver HRR in low-income countries , which indicates the growing need for a health sector specific framework to monitor rehabilitation services. The three groupings of clusters in the concept map resemble to key building blocks of WHO’s Framework for Action on Strengthening Health Systems  which provides empirical validation for viewing the rehabilitation sector as a subsystem of the overall health system. Health systems have been described as complex adaptive systems , meaning that they are constantly changing as they are susceptible to internal and external influences, and are composed of various subsystems. In the context of rehabilitation, it has been argued that decision making teams and service organizations operate in a chaotic environment and thus constitute self-defined, unpredictable subsystems of broader healthcare systems characterized also by complexity and interconnectedness whereby components of these subsystem affect each other [69, 70, 71, 72]. In our conceptual model, the words in the cluster labels represent inputs, outputs, initial and/or final outcomes but also processes, flows, controls and context across the system strengthening chain. Each of these words triggers a response by the others, e.g. legal commitments dictate the establishment of national priorities, optimal workforce planning drives better performance, effective coverage leads to enhanced utilization. Specifically, the Legal Commitments and Strategic Priorities cluster underlines the obligation of States to incorporate the key provisions of the CRPD in domestic legislation (Indicators #103, #20, #79, #14, #15, #56, #81) as a crucial means in realizing the right to health of persons with disabilities  and strengthening health systems [75, 76] and suggests that national priorities in the context of SDGs (Indicators #17, #66, #39) be informed by the international human rights standards, a view that is shared widely among leading commentators and global health experts [77, 78, 79]. 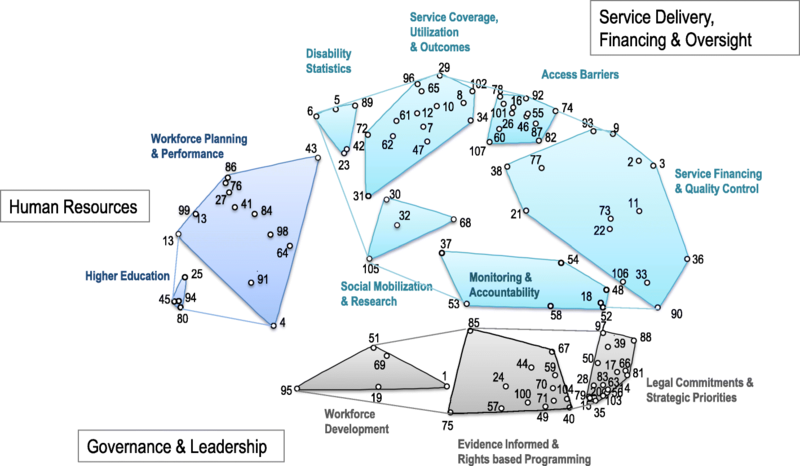 A similar interpretation can occur across other clusters of indicators allowing an in depth examination of systemic issues pertaining to rehabilitation service delivery, financing and workforce planning. Additionally, assistive technology indicators have received little attention in previous studies. In our study these included measures of affordability (#31, #82), service and financial coverage (#11, #65, #107), geographic access (#60, #78), patient experience measures (#84) as well as indicators that capture States’ policy efforts to promote the availability and use of assistive technologies(#39, #49, #63, #73, #90, #97). These indicators reflect the strong link between health systems, assistive devices and human rights [18, 92, 93, 94] and therefore highlight the need to consider assistive devices in future service and policy audits especially in the context of SDG monitoring . The framework described in this paper has important policy implications. Firstly, the RESYST and its content constitute useful tools for the successful implementation of the WHO’s Global Action Plan on Disability, under which governments are responsible to “provide health sector support for monitoring and evaluating the implementation of health policies to ensure compliance with the provisions of the Convention on the Rights of Persons with Disabilities” [p.10] and to “undertake situation analysis to inform policies and planning” [p.17] for rehabilitation. Also, the RESYST provides the preliminary evidence base to support the implementation of WHO’s recommendation “to assess existing policies, systems, services and regulatory mechanisms, identifying gaps and priorities to improve provision” [p.122] of rehabilitation. The clusters and indicators offer a data driven basis for Ministries of Health to develop sector specific reporting tools, including country templates, that can guide the collection and analysis of pertinent information and provide a rapid indication of progress towards the implementation of the Action Plan and other widely agreed policy recommendations. Such structured templates and instruments have been developed and applied successfully in the context of mental health [104, 105, 106] and it is believed that replication of such an approach will impact positively the rehabilitation sector. 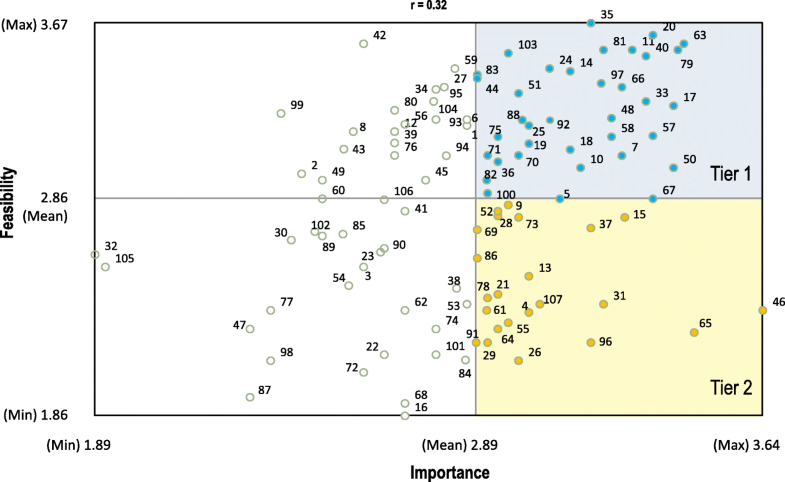 Additionally, the indicators have the potential to inform the development of standardized data collection tools and resources by public health analysts and researchers, such as structured questionnaires, surveys and key informant interview guides and thus contribute to the harmonization of data collection practices in rehabilitation services and policy research. 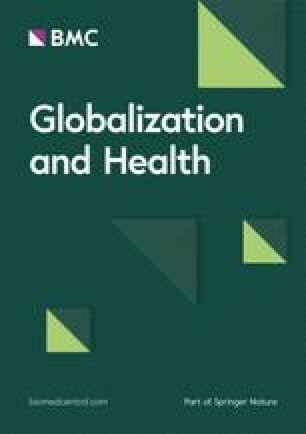 Populating the indicators with reliable and comparable data at regular intervals in the future may enable the comparative and longitudinal benchmarking of rehabilitation services and help decision makers draw more meaningful conclusions based on sophisticated country level analyses of the rehabilitation sector.